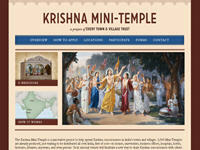 The Krishna Mini-Temple project is a scheme that is supplying mini temples free of cost to ISKCON preachers in India. The attractively designed Krishna Mini-Temple with wood-finishing features an altar along with enclosed shelving to store Krishna conscious books. Also included are beautiful resin deities of Gaura Nitai, Radha Krishna and Nrsimhadeva and the guru parampara that do not require daily worship. The mini-temple measures 5 feet tall, 3 feet wide and weighs about 70 kgs. The Krishna Mini-Temple would be made available to those that would genuinely use it to expand Srila Prabhupada's mission throughout the Indian subcontinent; in places where there is currently no preaching such as smaller towns, villages, colleges and other venues. 3,000 of these attractive Krishna Mini-Temples have been produced and are available for pickup in Vrindavan, Mumbai and Khargone (in Madhya Pradesh). The recipients would be expected to take care of the Krishna Mini-Temple and would be eligible to keep it at no cost so long as it being used for genuine preaching purposes. Category Organizations April 4, 2013 by ISKCON Desire Tree.